Weighing is one of the oldest methods of gathering objective information on animals and has long been regarded as an important tool on which farm management decisions are made. Astute stockmen claim that they can judge the liveweight of animals without using scales, however what they don't realize is that this skill has been acquired after many years of benchmarking themselves against objective weights (derived by weighing). While a high level of competence may have been achieved, they are neither as accurate nor as consistent at judging weight as a set of scales. > Optimize production by monitoring the live weight of pregnant and non-pregnant females. > The group or mob of animals must be weighed in as short a time as possible, as gut fill can affect weights considerably and lead to bias (see table one). > Animals must all be weighed on the same day, otherwise the computer will automatically form a new group. > Always take a weight before a different treatment is given to some animals within the group e.g. some bull calves are castrated. > Keep the number of weigh groups to a minimum Ð a compact calving is one way of achieving this, as the computer automatically divides calves into groups according to their birthdates. For birth and 200-Day Weights, the groups span 45 days and for 400 and 600-Day Weights, the span is extended to 60 days. > It is not essential to weigh animals on the suggested date Ð Breedplan will adjust the weight to the appropriate age i.e. 200, 400, 600 days. > Calves weighed between 80 Ð 300 days are analysed for the 200-Day trait. Calves weighed between 301 Ð 500 days are analysed for the 400-Day trait. Calves weighed between 501 Ð 900 days are analysed for the 600-Day trait. > Accuracies are driven by the amount of information on animals, so weighing dead calves and castrated males, together with any other cull animals, will improve accuracies. > Breedplan can handle two records for each weight trait. For example, weights can be taken at 370 and 430 days for the 400-day weight trait. The additional weight improves accuracy slightly. Ensure the same animals are weighed for each weighing otherwise the computer will form another group. > If some animals within a group are given different treatment to others, they should be weighed in groups that correspond to that treatment. > Use the opportunity to take other measurements on animals while weights are being recorded e.g. take scrotal size measurements when 400-day weights are being taken. > Don't submit weights on heifers that are more than 3-4 months pregnant, unless they have been exposed to the bull for a very short mating period and have all been pregnancy tested in calf. > For the trait, Mature Cow Weight, both cow and calf need to be weighed at weaning (200-day weight) with preferably a condition score given to the cow. 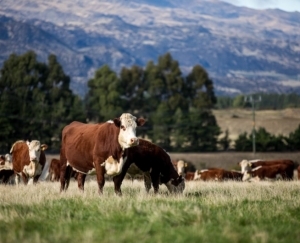 Establishing liveweight gain is an essential part of monitoring the growth progress of cattle. Accurate records of liveweight are therefore important. Estimating rate of liveweight gain is critical in monitoring progress towards achieving targets and planning against potential failure in meeting targets. Gut fill has a major influence on the variation in liveweight , therefore when weighing stock it is important to do this at the same time of the day or at the same time in the animals' grazing cycle, so they have a consistent gut fill from one weighing to the next. A good time to weigh is at the completion of grazing a paddock. The gut fill of a cattle beast can decline in weight by 40% and 60% after being off feed for 12 and 24 hours respectively (see table). In adult cattle, gut fill may account for between 12 to 22% of liveweight. The above represent average figures, therefore there will be considerable variation between animals, depending upon the feeding levels and the digestibility of the feed. For example, gut fill loss on highly digestible feeds, such as clover, is likely to be larger than in cattle being fed hay or poor quality green feeds. Weighing 10% of a mob every month provides a good picture of growthrate in the whole mob. The operator will soon get a good idea of the optimum number of animals to weigh and frequency of weighing, in relation to the time available to carry out the task and the accuracy level required. 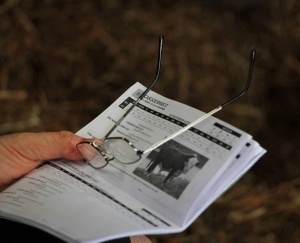 > Weighing livestock should be an essential part of farm management decision-making. > Investing in a set of livestock scales has the potential to give a massive return on the capital invested. > Gut fill can have a significant influence, when monitoring animal liveweights. > When monitoring liveweights on a group of animals, be consistent with the time of the day the animals are weighed and/or the stage they are at in their grazing cycle.